March | 2010 | Living life in the carpool lane.. So.. I got my Cricut Expressions a few weeks ago.. and I have to say.. I LOVE THAT THING!!! March is the month of birthdays.. so I’ve made a few cards for those that are celebrating birthdays.. This entry is photo-heavy.. so enjoy! I first wanna show off my workspace.. 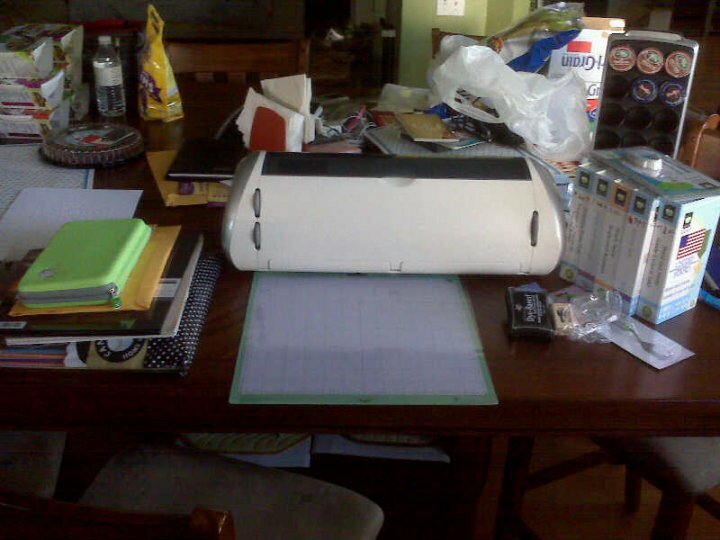 This is where I do my work.. It’s our dining room table.. so I obviously have to pack and unpack for every project.. this is the first time that I actually don’t mind cleaning up after myself.. haha.. and those who know me know that I hate cleaning! Anyway.. on to the projects! This was my first project.. I went to the local scrapbook store and bought the paper and stuff.. I love how I did the JOE lettering.. but the rest of it just looks so elementary and out of place.. I feel so bad because this was for my fiance’s birthday.. it was my first project and I wanted it to be special.. but I had limited supplies.. and wasn’t fully familiar with all that i could do.. poor baby.. I feel so bad his card is sooo ugly compared to everything I’ve done since.. which hasn’t been much.. but I’m seeing an improvement..
After going on a few crafting blogs.. I got the inspiration to do some layering.. 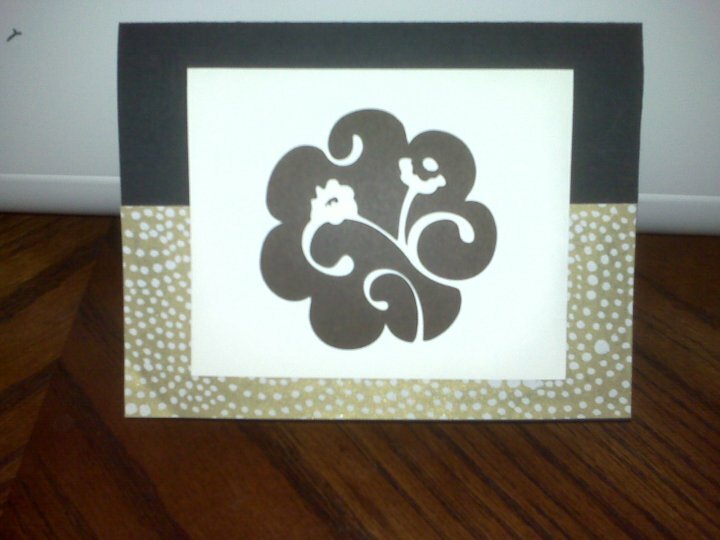 I used some of the materials I had left over from my save-the-dates.. and I made this cute card for Joe’s mom.. I think I need a fancy ATG glue gun because a few days later.. the white part popped off the card.. i was still able to make it stick.. but that really should not have happened.. I hope that making sure my future projects are set under heavy weights after I make them will remedy this problem.. 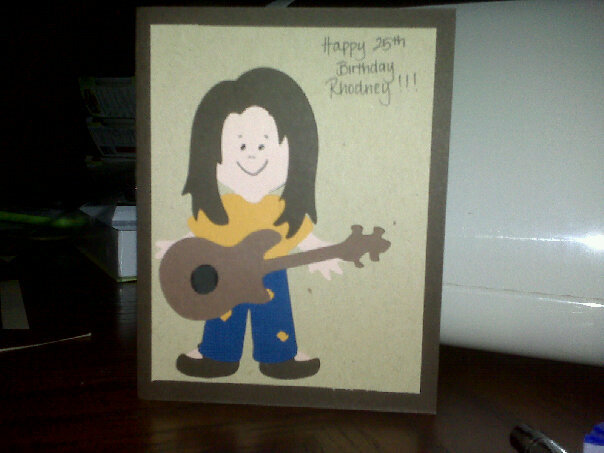 This is the last card I made.. I made it today. My brother’s birthday is coming up and I wanted to make something special and personalized. After putting the card together I realized that I didn’t have room to stamp “happy birthday” with the current stamp I owned.. so I had to write it out myself.. I also have a lot more paper.. colors, weights, and textures.. so my cards can have a variety of looks now.. it’s come a long way from the very first card I made for Joe.. again.. poor hun! These are what I have done so far.. and I plan of posting my projects as time continues to go on.. I hope you all enjoy these.. I would love anyone to leave any comments or suggestions for future projects.. I’d love more inspiration! In: Boyfriend.. girlfriend.. relationships.. | Here comes the bride.. | Random-isms.. Wedding planning has definitely slowed down in these past few weeks.. The running around trying to find vendors is all done.. I’m pretty much set with all the people I’ll needing to work with.. except my day-of wedding planner.. I still need to consult with Joe about that before I finally book it.. I really want a day-of planner.. I think it would relieve a lot of the day-of stresses that could occur.. But what I am experiencing is the calm before the storm..
I’m just putting the simple things together before I dive into invitation making.. and after the invitations get mailed the chaos of table seating charts and rsvps will begin.. but I’m ready for that.. I’ve got my computer and a calm head.. sort of.. mainly I’ve got my mom and aunts to help me with that..
I’m just enjoying the calm.. Sometimes I wish the wedding would come sooner.. but that’s because there’s nothing for me to be scrambling about doing at the moment.. I just enjoy the browsing and daydreaming.. and helping other friends that have found themselves planning a wedding themselves..
Oh ya.. and I’ve also gotten into paper crafts.. 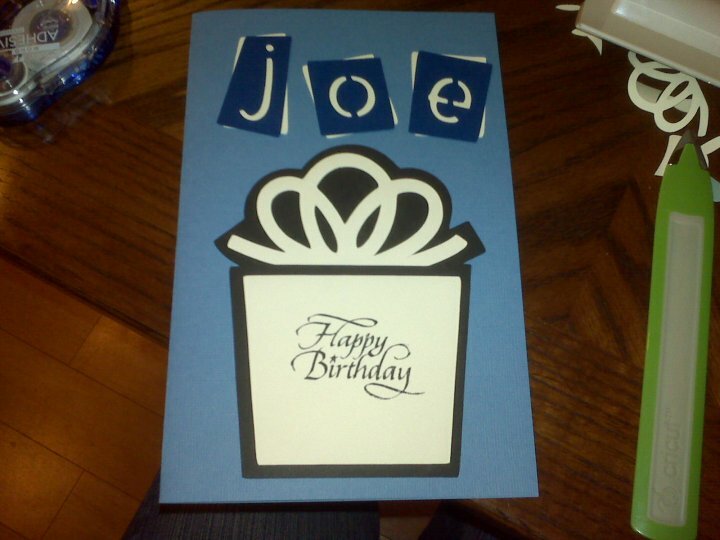 I bought my Cricut Expressions and I’m in love with it.. I’ve already made birthday cards for Joe and his mom.. they look decent.. once I build my arsenal of material.. I think my projects will start looking better..
I’ll post pictures of my work.. I promise..